It would seem increasingly likely that we are going to see an introduction of luminaires housing laser-diode technology in architural lighting applications within the next few years. Indeed the technology has been used within the headlights of cars such as the BMW i8 and the Audi R8 LMX already. High luminance laser diodes offer advantages over lighting technologies such as LEDs and OLEDs. Unlike LEDs, laser-diodes are "droop-free", i.e. they maintain efficiency at higher drive currents and now when combined with phosphors can safely produce highly directional output with superior delivered lumens per watt. Laser diodes have the same benefits as other solid-state lighting technology in terms of low power consumption and long lifetimes but also have the potential for superior light control, highly collimated safe light with miniature optics and reflectors. Therefore we can expect to see smaller footprint luminaires in the future used in a variety of applications such as in the retail and hospitality sectors and also used for the lighting of architectural facades. LEDs are high efficiency, but provide low luminance, and are poor at creating beam angles below 10 degrees. When laser light components are assembled into collimated modules, and deliver beam angles of less than two degrees from miniature 25mm optic diameters, roughly 1/10th the beam angle of LED sources is achieved. Analysis of the intensity gradients from high-luminance sources showed laser light exhibits ten times the gradient of LEDs, allowing high precision beam shaping. 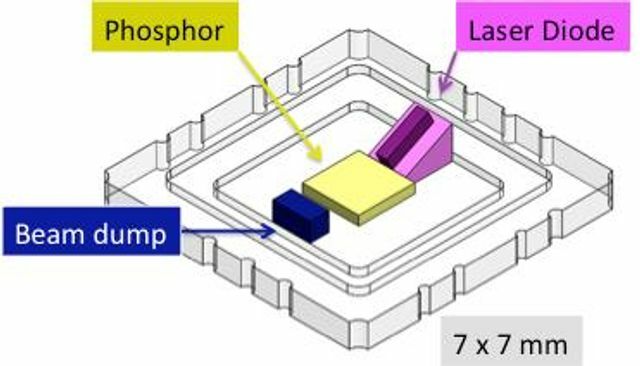 Laser light sources enable micro-luminaires, ultra-short throw modules, and waveguide-delivered remote sources, and are being adopted into architectural, entertainment and outdoor lighting. Looking ahead, dynamic laser lighting modules permit time-varying illumination capabilities spatially, and temporally. Such sources may enable the convergence of projection with lighting, dynamic beam shaping, beam tracking of objects or persons, and laser LiFi with data rates ten times that of LED-based LiFi.